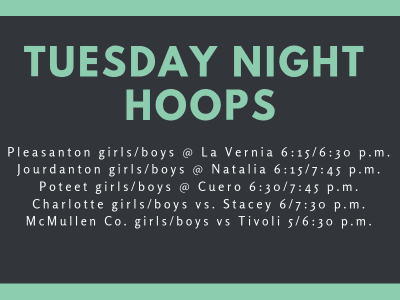 Tuesday Night’s basketball lineup. Follow us on Facebook or Twitter (@PE1909) for live game updates. Pleasanton girls/boys @ La Vernia 6:15/6:30 p.m. Jourdanton girls/boys @ Natalia 6:15/7:45 p.m. Poteet girls/boys @ Cuero 6:30/7:45 p.m. Charlotte girls/boys vs. Stacey 6/7:30 p.m. McMullen Co. girls/boys vs. Tivoli 5/6:30 p.m.